What is this tragic scene, and why has it been etched into what looks like a collectible, commemorative spoon? 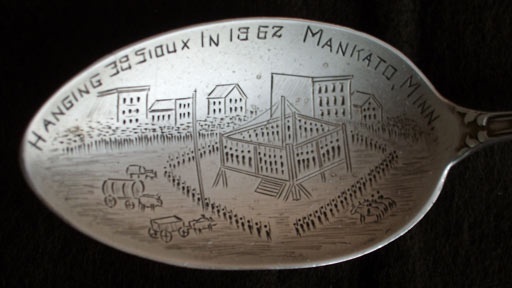 History Detectives explores the clash between white settlers and the Dakota Sioux in the mid nineteenth-century - and a struggle that led to the largest mass execution in American history. Related Investigation Seth Eastman Painting Is this painting a true depiction of Native American life from one of the premiere painters of the American West? Related Investigation Witch's House Could this house have once belonged to a woman executed during the Salem Witch trials? Also in Expansion: 1801-1861 Creole Poems Does this manuscript contain words of love or illegal acts of rebellion? Also with Wes Cowan Mark Twain's Watch Was this watch a gift from noted author American author Mark Twain? Also with Wes Cowan U.S.S Olympia Glass Could this farmhouse door have sailed into battle in one of the country's greatest naval victories?